It was the weekend of the St Jude storm. The wind was whipping across the harbour, cormorants – or were they shags? – were being blown across the sky as if they were F15 fighter jets, while Mungo, my nearly-three-year-old son, was being blown across the deck of our small custard-yellow ferry like a piece of tumbleweed. He seemed to be quite enjoying it. Lucky his mother, sitting sensibly inside the cabin with our other son Sam, can’t see him I thought, as Mungo reached the boat’s guard rail and peered down, fascinated, at the spitting, foamy water below. At this rate, just getting him to Brownsea would be an achievement – never mind seeing a red squirrel. Because that’s what we were here for – the next chapter of our quest to see as many as possible of the animals featured in Julia Donaldson and Axel Scheffler’s masterpieces, The Gruffalo and The Gruffalo’s Child. And this quest had brought us here, to Brownsea Island, a large, wooded piece of land in the middle of Poole Harbour on Dorset’s south coast. 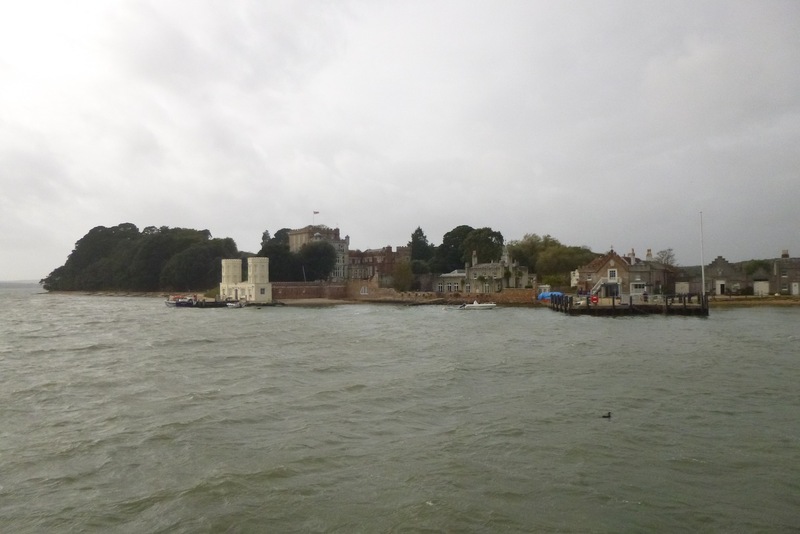 Approaching Brownsea on the ferry – this photo does absolutely no justice to how windy it was. 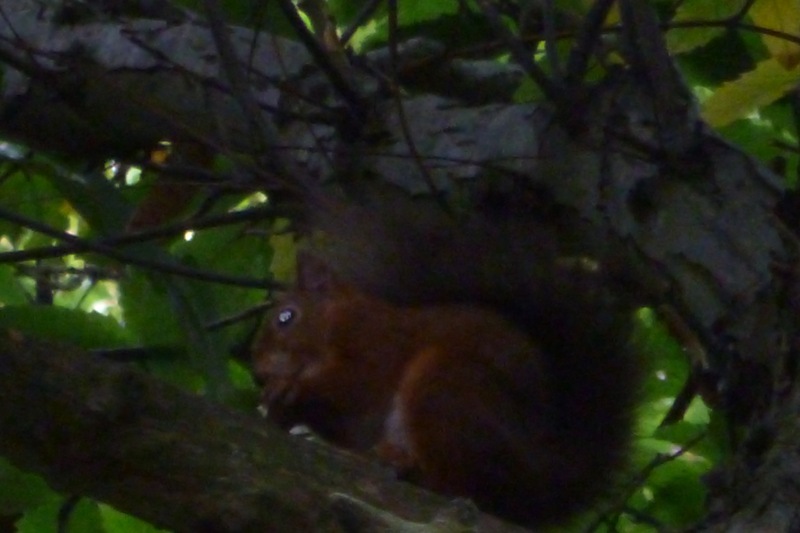 Brownsea is the only place close to our home in Gloucestershire where red squirrels still survive and can be easily seen. They’ve been ousted from most of England and Wales by their American cousin the greys, which were brought here from the other side of the pond in the 19th century, let loose in the 1870s and have been making life intolerable for the reds ever since. Landing on the island without catastrophe, Louise and the boys quickly made the most significant find of the day – the café, and in the café’s garden, the sandpit. Disaster! Suddenly, I had a sinking feeling that we would never leave this nirvana to explore the rest of the island – or find any squirrels. 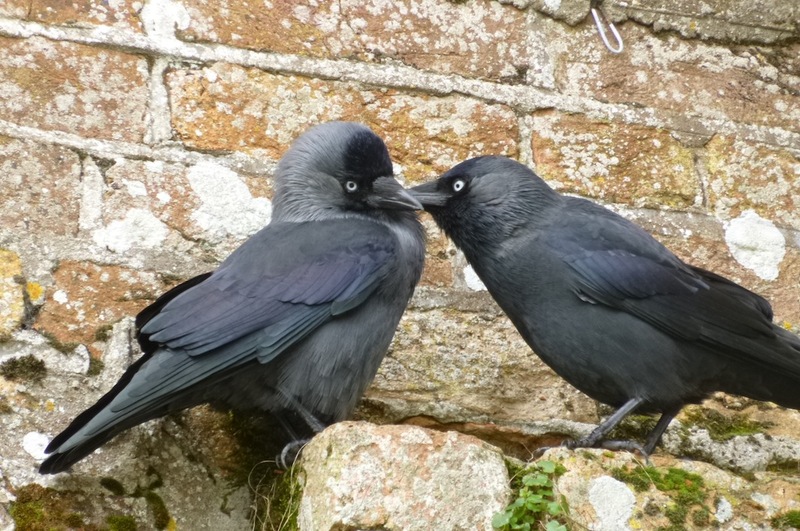 I consoled myself by watching a pair of jackdaws that had made themselves equally at home there, but we needn’t have left our house, let alone come to Dorset, to see jackdaws. The National Trust – which owns Brownsea – had organised a squirrel walk for later that morning, so dragging the children away from the sandpit, we lined up with other parents and their offspring and set off into the island’s interior. Pausing briefly to point out a tiny snail that belongs in the warmth of the Med (it hitched a ride here on some Greek or Italian masonry, apparently), our squirrel walk leader took us into the woodland and showed us some of the foods red squirrels like to eat – sweet chestnuts and pine nuts, of which there were plenty. Acorns, by contrast, don’t agree with them (though greys love them). 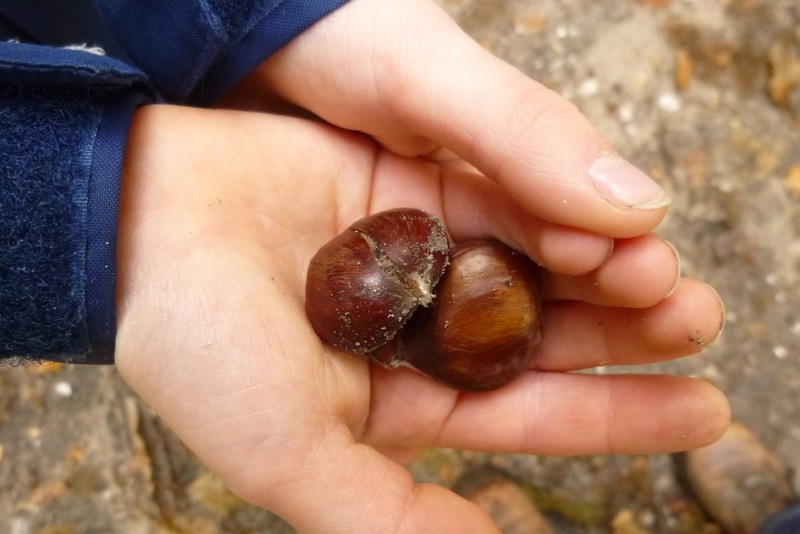 Sam shows off some of the chestnuts we found – favourite food items for the island’s reds. We rounded the island church and entered another area of woodland where peacocks were wandering around as if they owned the place. The walk leader was now explaining how squirrels bury their food and then find it again, but Mungo scampered off to chase those plump and rather dozy-looking birds. Deciding that I couldn’t be seen to permit the harrassment of a wild (if not native) bird, I’d just picked him up and he’d just started hollering at the injustice of it – he can’t yet say, “Put me down, put me down”, but he doesn’t need to – when I spotted it. A red squirrel, Squirrel Nutkin. The only shot I took of our red squirrel – holding children and taking photos rarely go hand-in-hand. Luckily, I didn’t have to yell out and frighten the poor beast into leaping for safety into Poole Harbour, because everyone else seemed to spot it at the same time and suddenly the eyes of 30-odd adults and children were watching it intently. It was remarkably unconcerned by all this attention, but then it was feeding on a satisfyingly large chestnut. I wouldn’t quite say our children – children who, remember, normally only care for trains, planes and automobiles (and the odd tractor) – were watching the squirrel in rapt silence, but they were at least watching. Amazing. Louise and Mungo even saw another one a few minutes later. I am sorry to say, however, that we now concluded that by now the boys had had enough of the official walk leader’s (engagingly delivered and informative) spiel, so we branched out in freelance fashion to explore the woodland for ourselves (a lot more peacocks, no more squirrels). Finally, we made it back to the café. There had been the promise of ice creams, and we couldn’t disappoint – otherwise, Sam certainly would never trust us again when we took him on another of these escapades. 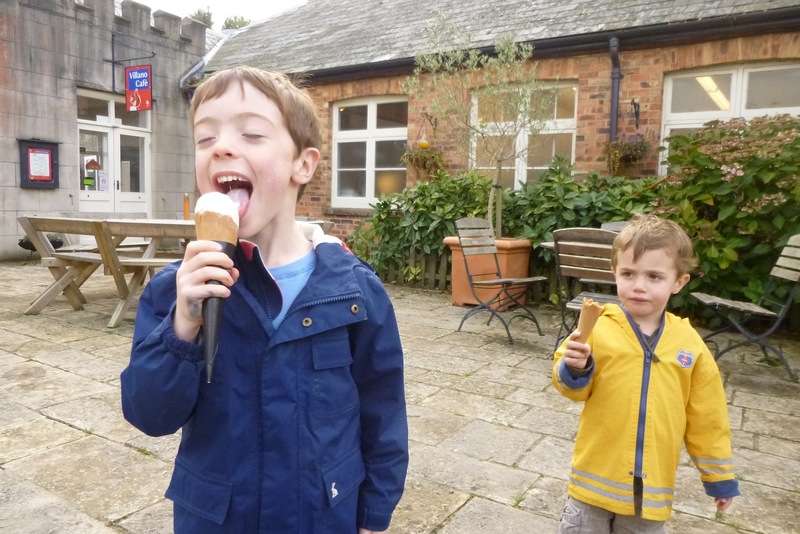 Ice creams for our squirrel-searchers – Sam later said it was the best thing about the day on Brownsea. On the way back to the ferry, Louise hurried the kids through the obligatory shopping experience to avoid any unnecessary purchases (sorry, National Trust), while I lingered at the point overlooking Brownsea’s large, enclosed lagoon. I don’t know how I hadn’t noticed them earlier – oh probably something to do with being repeatedly head-butted by a small child, though I can’t be sure – but there were hundreds of avocets out there, beautiful, delicate black-and-white waders with gently upward-curving bills. I had no more than a minute to myself, but I gazed out across the lagoon and the birds feeding happily there. One day, I thought, my kids might even appreciate it. If we just work on maintaining the bribe count high enough.